James once looked at my Christmas baking, regretful, since I usually only have the patience to make wine biscuits these days. "I'm sorry—they just don't do anything for me." With a small bow to Truman Capote's "A Christmas Memory": "Imagine a Saturday in mid-December. Outside the air nips and breathing frost the air, but there is probably no snow on the ground. The New England white Christmas of legend chiefly takes place in the north: New Hampshire, Vermont, Maine. Inside the four-room home, the steel radiators under the windows (and later the long, low grey baseboard heating vents) render it warm and cosy. To assure winter warmth, like half the front doors of that era, the gap between the varnished front door and frame is stuffed with strips of old flannel pajamas against the bite of the north wind, the door closed for use until March." But, unlike Capote's, this tale isn't about fruitcake, it's about cookies. Sugar cookies were unknown in our house. We were Italian and made Italian cookies. Mom always made four different kinds: butterballs, molasses cookies, almond bars, and wine biscuits. In kitchens all over Providence and Cranston and elsewhere in Rhode Island, my aunts and cousins were making the same kind of cookies, and other Italo-American mothers and daughters, in "Federal Hill" and "Silver Lake" and Knightsville and other Italian communities, were doing the same. Some made other types of cookies, ones with Hershey kisses in their centers, or baked stacks of pizzelles in special pizzelle irons like waffle irons, leaving the strong scent of anise permeating their homes. 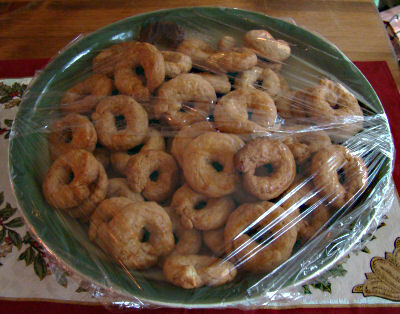 Ambitious and patient women like my Aunty Petrina made wandis, which are like an Italian wonton cookie, but instead of being small and flat, they are long ribbons of dough tied into knots and coils, deep fried in the deepest stock pot, then removed, drained, and sprinkled with confectioners' sugar. Made properly, when eaten they crumbled in your mouth like spun sugar, scattering flaky yellow crumbs and showers of sugar. They took hours of hot, backbreaking work to make and were a true labor of love; most people just bought them from bakeries. Imagine the small square kitchen of a 1950s Cape Cod house. One wall, the one overlooking the narrow, one-car driveway, has a window in the center, and a long counter against it, abutting the wall on one side and abruptly cut at the opposite end where the refrigerator sits, and is centered with a white porcelain sink and drainboard. Tall cupboards painted glossy white reach the ceiling, and more line below the counter alternating with drawers. The counter itself is of linoleum, speckled in the 1950s fashion, matching the floor, which has a black border around the edge, giving it a finished look. The stove is on the inner wall to the left of this countered wall, a second window and the door to the back porch to the right of it on the other outer wall. At this time of year, Mother has up the winter curtains on the two windows and the back door window, bright scarlet with white and black horse silhouettes on them. They are my favorites and she puts them up each year until they are too worn to hang any longer. In the middle of the ceiling hangs a red enameled light fixture made to look like an vintage lamp. 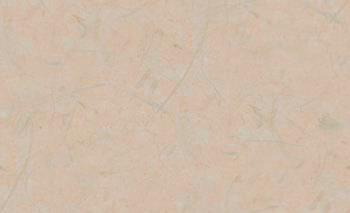 Opposite the cupboards, the wall is tiled in pale yellow edged in black, like the rest of the kitchen and the hallway. The walls are painted yellow. A big rectangular table takes up what wall there is opposite to the counter, because closest to the door is a big closet which is pantry, cleaning supply storage, and breadbox all in one, and mirrored on the other side is a doorway, the one to my bedroom. Some nights as I am floating at the edge of sleep, I can see Mom pad into the kitchen bundled in robe and slippers to light a burner on the gas stove. A soft, ethereal purply-blue flame glows to boil water in a tiny saucepan to be used for a cup of tea. It is a comforting sight on a winter night. The big table is lined with the various ingredients needed for dozens of cookiestiny glass bottles of extract, rectangular tins of spices, a yellow plastic canister of flour, a smaller yellow canister of sugar, the squat cylinder of baking powder, the large bottle of molassesplus the glass measuring cups and dull silver measuring spoons, and is covered partially with a long, wide board that has been used for cookie and pie baking for so many years that the oils used in various recipes have given it a sheen like polished furniture even though it is just a plain hardwood board from a lumberyard. To mix the dough Mom has removed from storage a large ceramic bowl she uses only for mixing cookie dough. 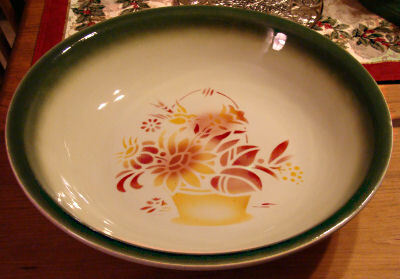 Its edge is dark green, with a stencil of a basket of flowers done in brown and gold in the center. It is of nondescript brand, labeled as made in Czechoslovakia. There is no pretty 1950s-1960s vintage recipe box like the magazines always show; our unorthodox recipe storage is an old cigar box still with its blue tax stamp, in which lives the classic cookie recipes hand-written on white or blue paper. And there on the table and in the little white Glenwood gas stove that so embarrasses Mother (the Providence Gas Company did not level it properly and all her cakes tilt sideways), we make magic. We make butterballs, which are called elsewhere Danish wedding cookies or even Mexican wedding cookies: sugar, butter, flour, baking powder, a bit of salt, a bit of vanilla flavoring, and chopped walnuts. Always Diamond walnuts, always Gold Medal or Pillsbury flour, always Calumet baking powder (I love the Indian on the label). The ingredients are as much of a ritual as the baking. When the butterballs are brown they are rolled in confectioner's sugar. The scent of fresh butter, vanilla and sugar fills the kitchen. Daddy loves the butterballs, but also likes the almond bars to dunk in a cup of coffee (later cocoa after he cannot drink coffee any longer) after supper, sitting next to the Christmas tree. Flour, sugar, a pinch of salt, baking powder, a bit of vanilla extract and slivered almonds come together for these. She makes them in long narrow loaves like French bread and when they are done, cuts them into slices like biscotti. Now the faint odor of almond joins the kitchen scents. The molasses cookies are my second favorite. They are chewy and deep chocolate brown with Brer Rabbit dark molasses and have a sweet, gingery, musty molasses scent. For years we argue: I hate nuts in cookies; she says they are traditional. So she makes two loaves, one with walnuts for tradition, one without for me. These are made loafways as well, and cut like biscotti. The rich dark scent of baked molasses is added. When they are finished and cool I cut a slice and am awarded with dark, rich sweetness with a bit of a crunch on the outside and chewy on the inside. Then come my favorites: the wine biscuits. They are a "biscuit" in the English sense, made of flour, sugar, a bit of salt, baking powder, oil, and wine. (The traditional Italian recipe, I have found, adds a bit of pepper, but this has been abandoned long ago.) It is my Grandmother Lanzi's recipe, says Mom, but she has adapted it by lowering the amount of sugar. She did this with all her recipes and I am still unable to eat things that are too sweet. I'm unsure where else the recipes diverge, because when my Aunty Margaret (the oldest of the Lanzi aunts) and Aunty Lisa make them, they crumble when you bite into them. Mom's are firm and crisp. The finest ones were made back before my Papà Lanzi died and for a few years after. He made his own wine in a corner of the cellar in the old house, blocking it away from heat so it was always cold, and cool even in summer. I remember big dark wine barrels laid on their sides and tapped, and the sweet/acid smell of his wine, made with deep dark purple grapes that steeped for ages before being pressed into wine and the wine was purple and so the wine biscuit dough was also purplish, a strange color with a heavenly scent. It is not an attractive dough, with a pebbly look, but it was as good to eat as the finished cookies, although Mom would protest when I did so: "You're going to make yourself sick." After Papà's death, when the wine supply finally petered out, and we had to purchase hearty burgundy from the liquor store, it wasn't quite the same. 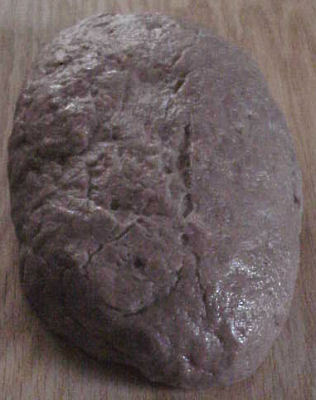 (Now when I make it, even with "hearty" burgundy," the color is anemic; I rarely get the strongly purplish dough anymore.) When the wine biscuits were finished, they were perfect to be savored in twos and threes with a glass of milk while sitting under the Christmas tree and watching the annual visit of Mr. Magoo, Charlie Brown or Rudolph. Our house was built as a two-story Cape, but the upper story was never finished, so the hardwood stairway led up to the cold, cold winter attic where memories and summer clothes were stored. The stairway kept cold as well, and here the cookies were stored, topped in plastic wrapped bowls or plates, one to a stair. Mom would place a few of each kind on a plate left on the kitchen table, but once those were finished, surreptitious visits were made to the stairway for more. On Christmas Eve and Christmas Day, and even through the New Year, Mom arranged a variety of cookies on Christmas-themed paper plates, a few of some, several of another, scattered with red and green and silver wrapped Hershey kisses (my aunts would add little boxes of torrone [Italian nougat candy]), wrapped them in plastic wrap, topped them with a bow. One would be carried with care and Sunday clothing to my godparents next door. I worried about my Godmother; she and my Godfather never decorated for Christmas. They didn't even have a tree. Padina Lillian would protest that Christmas was for children and she and her husband had none. When I was a teenager she finally bought one of those ceramic Christmas trees with the colored bulbs at the tips of the "branches" that you put a light bulb in. She placed it on her beautiful sideboard in the dining room on a crocheted doily and asked me, "Are you satisfied now?" Well, it was better. She decorated with Christmas cards around the door and a Christmas tablecloth, and somehow it felt better to me when a plate of Mother's cookies graced her table as well. One went to Padina's brother Jimmy (his name, like my grandfather's, was Vincenzo, but they called them both "Jimmy," a nickname I never understood) and his wife Dotty and their daughter Cindy. Another always went to my confirmation Godmother, Margaret (who sent cookies back, including the chocolate ones she knew I loved) and her family, and one to Margaret's oldest daughter, Barbara, who cut Mom's hair. When I was older I would take a plate to the Gustafsons, parents of my friend Cindy and her brother and sister, and to the Metcalfes, parents of my best friend Sherrye. And of course there would be plates to exchange with other members of the family. I'd whisper to Mom, "But yours are best!" which made her feel good, but I truly thought so. I'm not the cook my mom was, and one batch of wine biscuits tires me out. Sometimes I make two, but end up eating them myself; not many folks like themit's an acquired taste, I suppose, like sugar cookies. But it would be fun to share, on a Christmas paper plate, maybe with a few red and green and silver Hershey kisses scattered about. Lately I have been using a Splenda mix and making a batch of almond bars for James, something for him to dunk into his cocoa after supper, next to the Christmas tree. I attempted the molasses cookies many years ago, back when we were in the apartment. I followed the recipe exactly and ended up with a gooey dark-brown mess of dough that literally did glue my fingers together. I had to partially eat the raw dough and then scrub my hands for ten minutes to get it all off. I still crave them occasionally. As I incorporate the wet ingredients into the dry, mix the dough, then knead it in the old ceramic mixing bowl, I feel a deep kinship with my mother, remembering her strong hands with knuckles already enlarged from arthritis and roughened by jewelry work and hot water, dryness kept at permanent bay by nightly applications of Jergens lotion. Mom would have laughed to see Willow haunting the underside of the table, waiting for a morsel to drop; she owned little brown dogs all her life. The baking cookies give the house a heavenly scent, the scent of Christmas, and sit in an appetizing pile in the same bowl they were mixed in. They will be savored in twos and threes with a glass of milk beside the Christmas treewhile watching the annual visit of Mr. Magoo, Charlie Brown or Rudolph, of course.